How did your manuscript happen to be published by Barnwood Press? Had you sent it out much previously? It's the same sort of story as most people. Meaning, my book got published because of someone I know. Barnwood Press published a book I edited, Poet's Bookshelf: Contemporary Poets on Books that Shaped Their Art. These days Barnwood Press is primarily Tom Koontz, who I've known ever since I was an undergraduate when I had him for a number of poetry classes. Tom's always been very supportive of my work. I showed him a rough version of Hitler's Mustache and he immediately said he'd be interested in publishing it. I sent it to a couple of contests. I revised it more. I wasn't quite sure about the manuscript because I was still writing it and trying to understand what it was I was doing. I kept showing revised versions to Tom and he kept sharing his thoughts, which helped me when re-revising the re-revised versions. To me, it just made sense that Barnwood would publish it. I'm very grateful to them. Yes, and I feel lucky for that. I had real ideas about the cover. I had an image in my head that was part of my head when I was writing the book. It was based on a poster of Hitler from a book I have on art in Nazi Germany. The poster is a disembodied Hitler head staring straight at the viewer and above it reads, "HiTLER." It was the fact that this was in capital letters, except for the "i," that interested me. Also, the entire impetus for the book was based on a conversation I had with two friends about Hitler's mustache, which was first proposed as a great band name, and soon became a metaphor for Nazi Germany, and soon was imagined as a bar code. 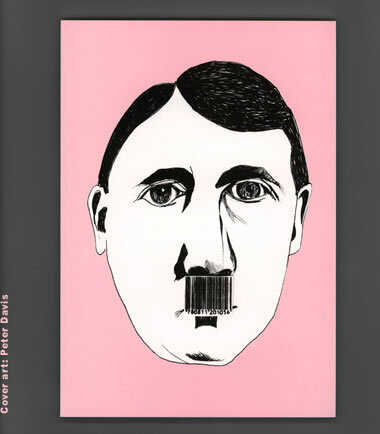 So that was the image for me: a disembodied Hitler head with a bar code for a mustache. So when it came time to talk about cover I was already there. I drew a picture of Hitler from the poster mentioned above, substituted the mustache with a barcode from a Henri Micheaux book (simply because it fit), and surrounded the disembodied head in bubblegum pink. Using pink was my wife's idea. I'm recounting all of this as if it happened in a logical and straightforward way, which it didn't. The cover seemed important to me. Probably because I often judge books by their covers. My sister-in-law was in town and staying with us when the books came. We got this box from the big truck. I was mad because I thought the pages were too white. My sister-in-law, who happens to be a good friend as well, didn't understand why I was upset. Also, my wife said, "I don't understand why you're upset--it looks great." Of course, I don't understand why I was upset either. I really like the book. I think it looks terrific and I like the white pages as it seems to make sense to me given the overall design of the book. Why I was upset can probably best be attributed to the fact that nothing makes sense. What I remember about that day is that I'm crazy. I guess I'm kinda always imagining my life will change. When I was kid, when I was playing basketball, or skateboarding, or playing hockey, or something, I was always imagining in my head that it was historic, that it was being noticed, that it meant something for the future. When I played music in bars I imagined that Willie Nelson would walk in and say "You're terrific!" I still do it. But now I know that what I can imagine is not a guiding rendition of reality. I imagine change because I can't stop it, but I'm happy with my life too. Has your life been different since? But were there things you thought would happen that didn't? Surprises? Not really. Except, I thought more people might be seriously offended by the book. Maybe they have been offended and simply not told me. I still worry about it. I worried about what my parents would think. Whenever a person writes in any way about Hitler, I expect somebody to have a problem with it. Of course, the book has only been out since Dec 1 of 2006 and thus there is still plenty of time to hear from the offended. Most people have expressed something like humor in regards to the book, which is certainly a huge chunk of it, but I expected a little more horror. What are you doing to promote the book? I'm going to do some readings (which I enjoy) and mention the book when I'm having casual conversations with people who might be interested in contemporary poetry. I may even mention it to some people who have no interest in contemporary poetry. I may forget to mention it, but don't take that as a sign that I'm not interested in mentioning it. I am. And, like everyone, I have a blog. My wife is always telling me really smart stuff. She's not really interested in poetry or literature. She understands some of it only because she understands me. She sorta checks out the journals that come in the mail. She's helped with submissions. She keeps my perception of life on a reasonably-lengthed leash. She says stuff like, "That doesn't make any sense," "Nothing you've said in the past twenty minutes makes sense," and "I'm trying to understand where you're coming from, but I don't get it cause it doesn't make any sense." She is, and has always been, a real help. She has good ideas. I'm not writing with the word "mustache" in every poem now or substituting otherwise important words with the word "mustache" or replacing all momentary lapses in thought with the word "mustache." I'm back to not being ruled by a single word (world). We'll see. I haven't had tons of critical response yet, at least publicly. I just got a review where the book was given 4 of 10 stars. Of course, I would have liked to have gotten 10 stars, but it didn't feel bad. It was a thoughtful response to the book. I can't ever seem to get a handle on what I'm writing. I don't know that I expect other people to. I don't know anything about anything. I can honestly say that when I'm creating poems or any kind of art--when I'm doing it, when I'm right in the moment--I'm not thinking of critical responses or anything. I'm not even thinking. At least, that's the hope. Or maybe it's a hyper-sort of thinking, like thinking so hard you're not thinking anymore. Are you at work on a second manuscript? I'm always working on something. Sometimes it's writing and sometimes it's music, or whatever. Right now I'm finishing a new Short Hand CD and writing poems. Whatever it is, I don't consider it to be a second manuscript only because I don't consider Hitler's Mustache to be a first. Before it, I had the ms I worked on for my MFA thesis (Origin of the Baby God), the ms I worked on for my MA thesis (The Curve of Kate's Nose), the ms I worked on called Einstein Included, the ms called Rock-n-Roll, the ms called Paris Is in Your Mind, and the ms called A Star Behind a Star. Sure. I think change is terrific. I'm actively trying to change. I hope that will help. Yes, but I don't know how or to what extent. I mean there's us, me, and whoever is reading this, and we're people in the world who are moving around and are objects to be considered like all objects, at least on certain occasions. And it happens too that we care about poetry (for whatever reason and with whatever capacity) and thus, there are people walking around in the world who care about poetry and are also part of, and affecting, the world. I don't want to demote or elevate the place of poetry in the world. I think that poets are no more capable or incapable than the rest of humanity when it comes to changing the world. We may have our moments, though we will probably never know when. Like everyone else, we are perpetually pushing against the wall, which according to string theory (as I understand it) could at some moment simply be nonexistent and then we will just seemingly magically walk through. Of course, we'll probably be so tired by the time it happens that we won't even notice.